Solar concentrators have been used on spacecraft, for collecting sunlight. More info below. Until now, no mission outside Jupiter's orbit has used solar panels. The first solar-powered Jupiter mission (Juno) used large solar panels instead of combining concentrators with a smaller solar panel. Saturn orbits at ~10 AU. So with the current state of the art, sunlight at 10AU is not bright enough to make solar panels (with or without concentrators) cheaper than an RTG. At Saturn, sunlight is 2.5 million times brighter than starlight. The tradeoff between solar panels and RTG is mainly because of weight constraints, I suspect: to launch a spacecraft to e.g. Saturn requires a large amount of delta-V which translates into an expensive launch that puts a tiny spacecraft atop the most powerful rocket we can find. This makes mirrors a hard sell: you'd have to build a good mirror that is lighter than a solar cell. If mirrors and solar panels are the same wight, you can either carry 2 solar panels or 1 solar panel and 1 mirror of the same size as the panel. Starlight is more or less isotropic. 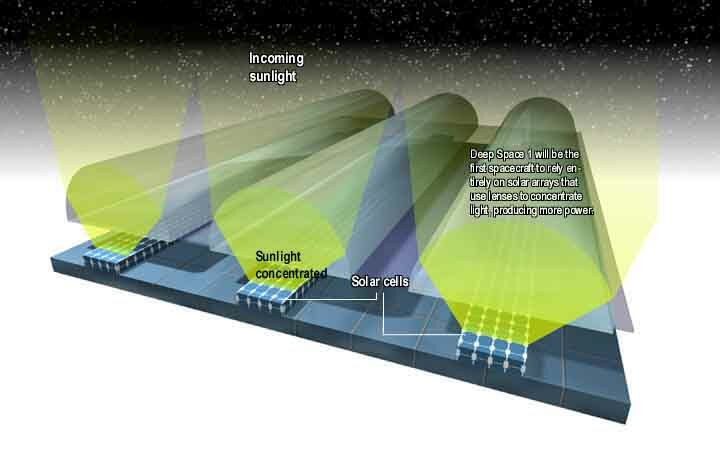 When you add a mirror to a solar array, you also block the light from the stars behind the mirror. Deep Space 1 used an ion engine, so this array "produced enough electricity to provide ongoing propulsion". Other missions (e.g. Dawn, which used the same type of ion engine as DS1) have used ion engines without solar concentrators. As you can see, the concentrators add a lot of material, so it may be cheaper to just install a bigger array. At first about concentrating sunlight. The Sun is a star like many others, but it is very close to Earth. The maximum distance of Pluto to the Sun is about 50 AU, that is 50 times the distance of Earth to the Sun. You would need a mirror with an area of 2500 square meters to receive the same energy from the Sun as a solar panel of 1 square meter receives in Earth orbit. But Pluto is just in the backyard of our solar system. The mirrors needed for interstellar space would be incredible huge and should be aimed to the Sun very precisely. Outside the Oort cloud at a distance of about 200,000 AU, that is the border to interstellar space. Now about the concentration of starlight. Starlight is extreamly weak, at the Earth about 100 million times weaker than Sunlight. But a mirror with an area of 100 square kilometers would not help. Starlight is not from a single tiny spot but from incredible many stars spread over the full sky and could not be concentrated by a huge mirror. Only a very small area of stars may be concentrated by an optical mirror to a small solar panel. Sirius is 25 magnitudes dimmer than the Sun. To collect the same power as 1 square meter of solar panel at 1 AU, you'd need 100,000 x 100,000 meter square collection area (100 x 100 kilometers). Since stars are so far away, it would be independent of distance to our sun. If your farthest reflector is 50 kilometers away from your 1 meter solar panel and you want to illuminate your panel uniformly for good electrical performance, you'll have to have all your reflectors pointing with an accuracy of a microradian, or about 0.2 arcseconds, which is mind-bogglingly difficult. You could make your panel 10 x 10 meters and run at 1% of solar intensity (which I think is still doable for some kinds of photovoltaics) and then have a pointing accuracy of 2 arcseconds, but going much farther pushes the limits of efficiency. If you are far from the Sun and other sources of heat, the cold will help the efficiency. You can go to non-focusing optics to re-concentrate the light from a larger circle of confusion. Can I avoid a magnetar with an electromagnet? How to go about calculating the size and energy requirements for a space-based linear accelerator or railgun to accelerate small probes?